Australia has about 35 or so endemic species of Hibiscus and Hibiscus divaricatus. 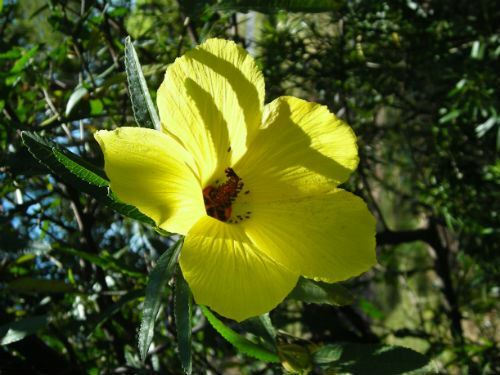 ‘Golden Haze’ is a selected bright yellow flowering form of Hibiscus divaricatus. It has large, showy, bright yellow flowers to about 8 to 10 cm in diameter with a red stripe surrounding the petal spot. With Hibiscus plants, the flowers only last for a day or so, however in its natural setting from the top of NSW to the eastern side of Cape York it has a long, nearly continuous flowering period. 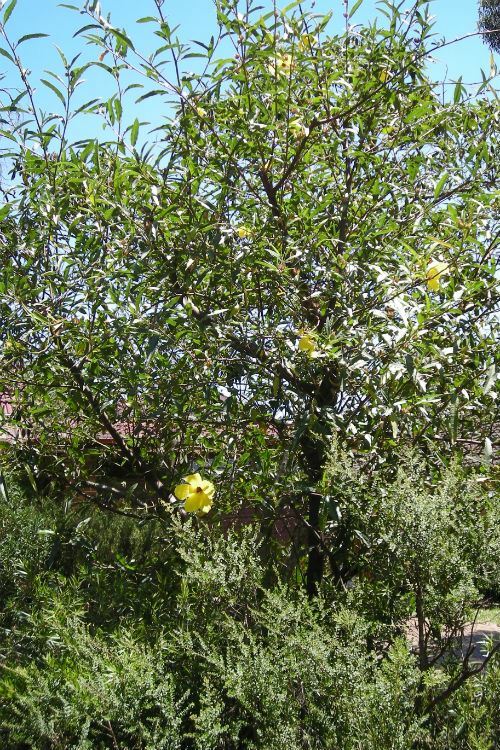 I have been growing Hibiscus divaricatus ‘Golden Haze’ for many years, in my garden in the northern Sydney suburb of Westleigh. I have found it to be a reliable and fairly tough plant once established. Growing it this far south requires some protection from frost and I am fortunate that where I have it growing it is protected. They grow to about three to four metres high with a similar spread and produce their flowers in spring through to late autumn. The only maintenance required is to prune them back by about a third in spring, when the weather warms up. Pruning in winter is not a good idea, as the plant may be lost in the cold weather.